Now, that's a pretty leaf. I don't know who you are, where you been or what your taste is in leaves, I just know you can't deny how striking that leaf is. Just look at it. Good lines, fine gradient change from a good, basic green to light green to cream to a rosy edge. It's the best corn I have growing right now, Zea mays Quadricolor Variegated Ornamental Corn. That's what the seed packet says. It bothers me a lot little bit that there is no variety listed. Is Quadricolor the variety? 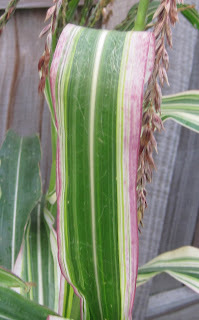 Is Quadricolor Variegated Ornamental Corn the variety. For all of its fanciness, this corn is a survivor. I'm embarrassed to tell anyone how I mis-treated it from the time I sowed the seeds until I planted the seedlings in the garden and even after that. I didn't abuse them with too much water, too much light, too much dark or anything harsh like that. I sowed the seeds and forgot about them. NOT A SENIOR MOMENT! Then about the time the seedlings had grown so much that they had pushed the clear plastic lid half off their little half-flat, I remembered I had sown the seeds in a some peat pots in the sunroom. Gasp! They had my attention at that point. It's odd to look over and see how a plant moved that lid. I have my suspicions. When mid-summer arrived... Ha ha, can't believe I did this. I ran off to Seattle on the very day it got to 100 degrees Fahrenheit and I made no arrangements for any supplemental watering the entire time I was gone. The leaves sort of curled in during that period of time. That's the corn's defensive posture to keep from transpiring too much water into the atmosphere when it is hot and dry. Oops. I watered them when I got home from Seattle. The leaves gradually uncurled, and now the corn looks nice again, though it is shorter than I had imagined it would be. Just imagine if I had actually cared for this corn, what it might look like now? That leaf is a beauty. I'm a sucker for variegation that has tints of pink. Will you get any ears from it for fall decorating? The three mug shots on the sidebar add from Criminal Records Online may not be exactly what you had in mind as a proper commercial for your blog. Still, it does go with the prevention of cruelty theme. BTW: That was a beautiful leaf. I was A-MAZED! Whooo. You lucky thing. For a minute, I thought you were going to write about the ornamental corn I became smitten with in the Epping garden in Seattle. Beautiful. And tough as nails, too? What a bonus. That is a good looking variegated leaf. So did those fairies sneak in and move that lid? The corn is beautiful, regardless of the "neglect". I would be happy to have that in mt garden and if it gave ears, so much the better. We tried growing this corn at least 4 years ago. I don't think it got enough sun (we don't have much in the way of full sun areas in our yard)plus it got stomped by children several times. It was pretty but was stunted. Maybe one year, we'll try it again out at our community garden.